Notes: Castle is located adjacent to a pay and display car park which can be accessed off Cleveland Way. Extensive ruined remains of a predominately twelfth and thirteenth century castle built to a slight unusual style with no central keep. 1. Unlike many medieval castles, Helmsley had no motte or central Keep instead using a double bailey system. This was modified into a single bailey when significant upgrades were made in the late twelfth century; the east tower was heightened and enhanced at this time to become the centre-piece of the castle. 2. Richard, Duke of Gloucester (later Richard III) was granted Helmsley Castle in 1478. Already a powerful landowner he owned a significant number of castles including Middleham, Sheriff Hutton and Penrith from the holdings of the former Richard Neville, Earl of Warwick. By his marriage to Anne Neville, daughter of the Earl, he also acquired Barnard Castle. His brother, Edward IV, also granted him Skipton Castle in 1475 then Richmond Castle in 1478. Built on a rocky outcrop overlooking the River Rye, Helmsley Castle witnessed only one major military action in its history when Parliamentary forces placed it under a three month siege in order to starve out the Royalist garrison. After this the castle was slighted on the orders of Parliament. 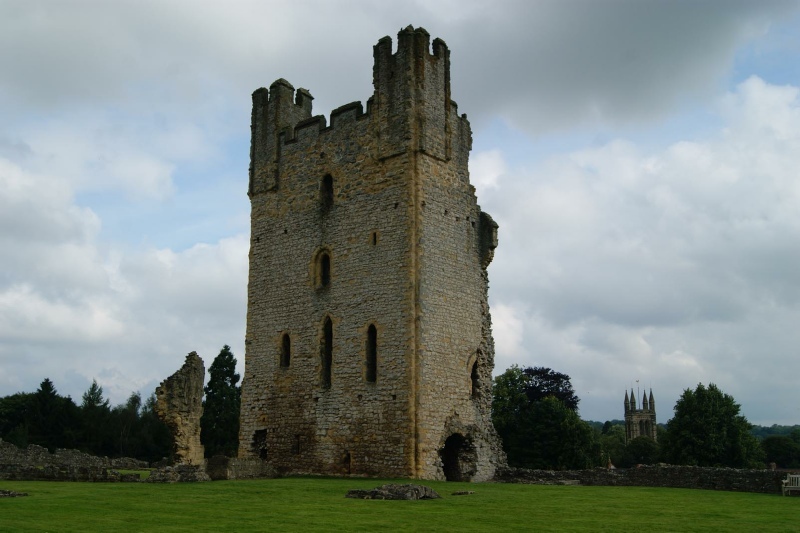 A castle may have been built at Helmsley following the Norman invasion or during William I's subsequent 'harrying of the North' in 1069-70. If so it was unlikely to have been a traditional motte-and-bailey as the rocky outcrop on which the current castle is positioned would have lent itself better to a ring-work fortification; a fortified enclosure using just a ditch and earth and timber rampart. The existence or not of this castle is conjecture as the first recorded castle on the site was established by Walter Espec in the 1120s/1130s. Espec, a prominent supporter of King Stephen during the Anarchy, used Helmsley as his principal residence. The castle was taken into Crown ownership in 1464 when the then owner, Thomas de Roos, was executed following the Battle of Hexham for his support for the Lancastrian cause in the War of the Roses. The property was restored to the Roos family following the Battle of Bosworth (1485) by the new Tudor King, Henry VII. In the mid-sixteenth century significant upgrades were made to the castle aimed at making it a comfortable Elizabethan residence; the Tudor mansion was added at this time. During the Civil War Helmsley was held by the Royalists and as their fortunes in the north deteriorated following the defeat at Marston Moor (1644), the castle came under siege. From September through to November Parliamentary forces surrounded the castle and, despite an unsuccessful attempt by Royalist forces from Knaresborough to lift the siege, the garrison was forced to surrender through lack of food. Sir Thomas Fairfax, commander of the Parliamentary army, slighted the curtain walls and east tower to prevent further military use. The Tudor mansion, however, was left intact.